What do you get when you take a Marathoner, a Steepler, a “1500m runner”, and two 10k specialists out on some grass? Though this sounds like the setup to a comedic punchline, the reality is a dominating expression of Bowerman TC’s belief in finding depth and strength in the team. BTC fielded a full scoring team of five athletes at the 2019 USATF Cross Country Championships in Tallahassee Florida. 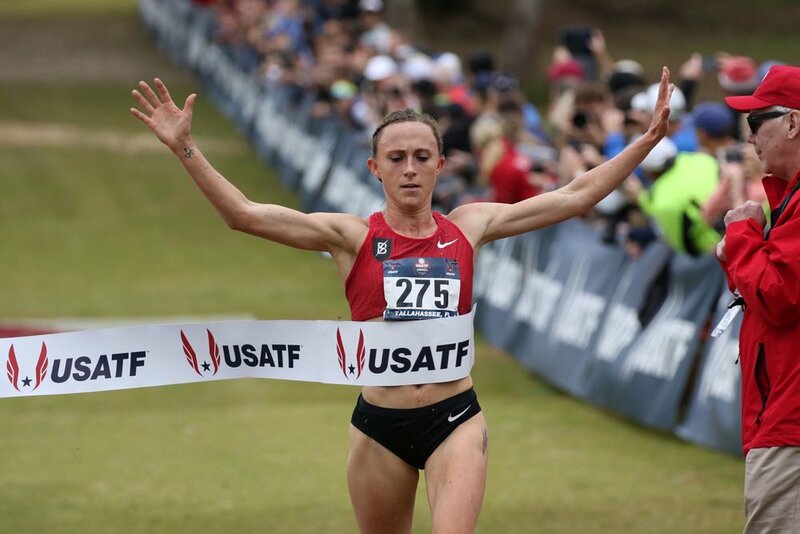 Shelby Houlihan, Marielle Hall, Amy Cragg, Courtney Frerichs, and Karissa Schweizer proved to be a formidable quintet of talent against what many called one of the most stacked fields of American distance runners ever assembled at a US XC Championship. Working together early, the BTC women found strength in numbers. With Amy Cragg taking charge, the lead pack broke away and laid down an extremely quick pace over the rolling grass hills in Apalachee Regional Park. Coming down to the final hill however, Shelby Houlihan threw in a dominant move and pulled away with 700m to go, crossing the tape as the National Champion and solidifying her 8th US title in total. Shelby Houlihan took first in 32:46.8. What happened next is indicative of the truly special team environment that coach Jerry Schumacher instills at Bowerman Track Club. BTC took five of the top seven spots. Karissa Schweizer 7th in 33:28.2. With Molly Huddle (2nd) planning on declining her spot at Worlds, all five are in line to make the team to Aarhus for the World XC Championships. Depending on Jerry’s race plan for the team, BTC has some serious potential to lead the United States to medaling at Worlds. BTC’s Masters team also had a good showing coming in 4th overall as a team, featuring long-time club talent Mile Blackmore in 8th, Matt Farley in 14th, Michael Gorriaran in 51st, and Steve Kollars in 54th.